No one is fine after a break-up. If either party had any emotional attachment to the relationship whatsoever, no matter how miniscule, there is no way that you can magically be “fine” after the relationship ends. Whether you’re drowning yourself in a pint of Ben & Jerry’s, cutting him out of all of your photographs, playing “We Are Never Ever Getting Back Together” on repeat or – in the case of Jessica Day and Nick Miller – watching Dirty Dancing and drinking, respectively, everyone deals with a break-up in their own way. There’s no right or wrong way to handle the demise of a relationship, but recognizing that it ended can be painful at best and downright devastating at worst. Our central New Girl couple realizes this firsthand in “Big News.” In the wake of their very recent break-up, the two attempt to navigate the awkward morning after-waters. One thing that inevitably occurs post-break-up is something that we see very prevalently in this New Girl episode: the attempt to convince your ex that you’re just fine without them and that your break-up? Well, it wasn’t THAT devastating. You’re fine. You don’t know why it’s coming out all loud and squeaky. Nick and Jess, rather than admit that their break-up is both devastating and impactful, decide to put on the common façade of “fine.” Nick’s fine. He’s handling everything well and isn’t curled up on the floor, sobbing and drinking. And Jess is fine. She’s not watching Dirty Dancing a dozen times in a row on the couch. They’re both fine. Totally fine. Except that they’re not even remotely fine as they soon admit to other people. Pride has always been a common theme in the Nick/Jess relationship. Jess has never wanted to be the first to admit something, nor has Nick. So they dance around their issues constantly, tip-toeing where they should be having open and honest conversations. It’s this lack of communicating feelings that affected them pre-relationship (we see it in “Quick Hardening Caulk,” “Elaine’s Big Day,” and “First Date” most notably). They’ve often played emotional chicken with each other and “Big News” is no different. But before I delve too deeply into the themes of the episode, let’s discuss the plot, shall we? “Big News” is one of the best episodes of this season, hands down. It’s written by Berkley Johnson (“Clavado En Un Bar”) and Kim Rosenstock (“Birthday”) who have written fantastic episodes by themselves but when their powers combined for this episode, the result was exceptional. I think it was probably the funniest episode this season, perhaps ever, and it contained just the right amount of heart to make it poignant. But what I truly loved was that even though this was an episode that seemingly focused on the fallout from the Nick/Jess break-up, it was actually a story about the loft and the relationship between all of these amazingly delightful and weird friends. It’s the morning after Nick and Jess’ big break-up and Nick wakes up in solemn disbelief, having believed it to all be a dream. I’ll pause right here to note the first of many elements that I loved about “Big News”: the interjection of angst without becoming melodramatic. There’s this perfect parallel between this episode and the morning of Winston’s birthday where Nick wakes up in utter disbelief at what had transpired the night before. This time, unfortunately, it’s with sorrow that he realizes his break-up with Jess wasn’t a dream. What’s even more painful is the shot of him getting out of bed and noticing Jess’ makeshift bed that she had constructed on the floor, away from him. I mean, stab me in the heart, right? But New Girl has never dwelled on sadness for too long which is a good thing. It’s important that a comedy have its foundation on substance and find a source of heart amidst all of the humor. It doesn’t need to turn into dense, heavy, dramatic series though in order to have a good emotional foundation. And I think that “Big News” proves that you can handle delicate and emotional topics within the confines of a comedy without becoming cliché or weighed down with angst. After an awkward encounter caused by Jess changing in his room, both decide that they need to tell their other roommates and friend about the break-up. And just like “Winston’s Birthday,” where Bob Day chooses the exact wrong time to visit his daughter, Nick and Jess find that this is the exact wrong day to tell everyone their big news because Winston has his own news: he’s gotten into the police academy! And like the good friends that they are (and because they’ve done this once before the year prior with Winston), the pair decide that they have to pretend like they’re a normal, functioning couple for Winston. They cannot taint his exciting day with their bad news. I love that this is what Winston focuses on and I love that Nick and Jess make the decision to let Winston – who never really gets the opportunity to have a win – have an entire day just to celebrate HIM. They’re both clearly hurting but their pain is not as important as Winston’s joy. Speaking of hurting, Nick and Jess are putting up fronts because it’s what they do best with each other. In “Mars Landing,” when they were building the toy for Sadie’s child, they pretended that the quirks of their partner and their vision of the future wasn’t worrisome or irritating. Nick put up a wall for a long time with Jess, never really telling her how he felt (“First Date”) because it was terrifying. These two are so great at putting up walls when they’re single that it’s no surprise that this is the default state they return to in “Big News.” Of course, Nick and Jess are not okay but they’re playing that game of emotional chicken that Jess played on the curb outside the restaurant in “First Date”: they’re both waiting for the other to admit a flaw or hurt before they proceed. In a short-lived B-story, Schmidt discovers that Cece is studying for the GED and is feeling rather down about herself because she hasn’t managed to pass any of the practice exams that she has attempted. What’s really great about this story (and what was great about the Schmidt/Cece story in “Birthday”) was the fact that New Girl didn’t try to make Schmidt’s gestures in either episode remotely romantic. His motivation in “Big News” felt completely in-character with how Schmidt is as a person and how he views others around him. His whole purpose in tutoring Cece was to make HER live up to her potential. (And also because Schmidt cannot stand when something isn’t done his way – “Thanksgiving,” anyone? – even if it means more work for him in the long-run.) So Schmidt decides to tutor Cece and it’s amazing. It truly felt like a return to form to their season 1, pre-dating dynamic. 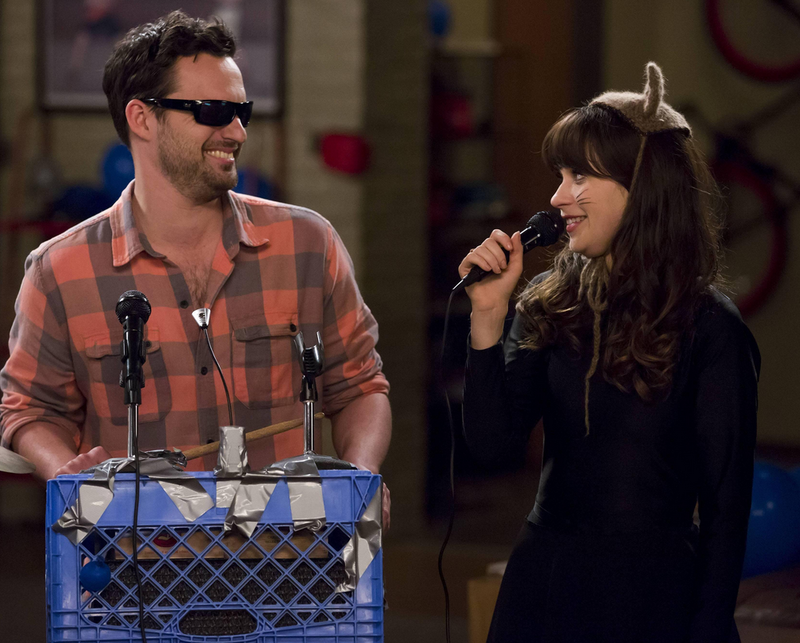 And really, if this is show New Girl continues to portray them, and Schmidt, into next season… color me happy. Coach is genuinely sympathetic (isn’t it great how much he’s grown since “Coach” in terms of character development? He actually HUGS Jess later in this episode, too) but also gives Nick some less-than-great advice: he needs to keep that pain suppressed to that Jess doesn’t see and get scared away forever. Coach’s advice? Schmidt has anti-anxiety pills and Nick should pop some. Cece’s advice to Jess is much wiser: the latter is so upset because Nick seems completely fine with their break-up. But Cece knows better. She knows that Nick is hurting and he’s masking his pain. Her suggestion is for Jess and Nick to talk it all out. At the loft, it’s nearly time for Winston’s Honey Roast, which means that it’s time for Nick and Jess to talk about their true feelings regarding the break-up, except… Nick is (much like he was in “Injured”) now high on a bunch of pills. Remember a few weeks ago when I discussed “Mars Landing” and the issue that one reader at The AV Club brought up? This commenter had noted that most major emotional developments/progressions in character had occurred under the influence of painkillers or alcohol. What’s so interesting about “Big News” is that the opposite is true: the painkillers for Nick serve as a way to AVOID being emotionally honest with Jess. I thought that was exceptionally interesting in how inverted it was that the drugs actually served as a roadblock for a development in Nick/Jess, not as a way to progress them. Jess is mad. Like… really, really mad when she believes Nick to be completely sober and completely okay with their break-up. So she does what any newly single female with some pent-up rage does: she drinks wine. And she drinks a lot of wine, to the point where Nick and Jess are the two evidently intoxicated emcees at Winston’s Honey Roast. Both Coach and Cece know about Nick and Jess’ break-up and yet both keep it secret from the other until Schmidt’s interference prevents them. As an aside, bless the New Girl team for not evolving Coach/Cece into a romantic pairing because honestly, these two as girlfriends is one of the best decisions the show has made. Schmidt enters the loft looking for Cece and demanding to know why she bailed on her studies. When she tries to cryptically explain that something bigger came up, she caves and admits to Schmidt that Nick and Jess broke up. Schmidt’s reaction to this is actually pretty telling. Remember how, earlier this season, he tried to break the two of them up? That wasn’t because Schmidt didn’t like Nick and Jess together. No, because episodes later, Schmidt admitted that being with Jess? That was the happiest he’s ever seen Nick be. Schmidt was in pain at the beginning of the season – of no fault but his own, of course – and was lashing out at the first bit of happiness he saw. His face in “Big News” when he learns of their break-up says it all: Schmidt may have been against the idea of Nick and Jess last year (“Virgins,” “First Date,” “Parking Spot,” etc. ), but he must have, in his heart, thought that they would always be together. And now that all three – Coach, Cece, and Schmidt – know of the break-up, they agree to not reveal anything to Winston. While Nick emcees the Honey Roast, an unsuspecting Winston, angry Jess, and pretending-to-be-oblivious trio of Coach, Cece, and Schmidt look on. It’s going about as well as you’d expect it to, when Jess finally snaps and takes the microphone from Nick and decides that it’s time to do her own – drunken – roast. It… goes about as well as you’d expect, considering Jess is a really nice person and drunk!Jess is really bad at insults. However, when she turns toward Nick and begins her roast, she tells him that the worst thing about him is that he’s fine with their break-up. And finally, that little bit of pain that Jess needed to desperately to articulate begins to surface. And the truth begins to bubble up until she confesses that she is not even remotely okay. This leads Nick to admit that he’s so far removed from “okay” that he took anti-anxiety pills in order to bury the pain. When Nick and Jess confess how much they’re actually in pain, it’s not just because catharsis is necessary but also because HONESTY is necessary. Until Nick and Jess continue to build their relationship from an honest place, they’ll never stand a chance of being good friends, let alone romantic partners again. Honesty is why these two broke up in the first place: they knew they needed to be honest about their wants and their needs and where they were at in their personal lives. It’s only fitting that they be honest from every moment thereafter, no? Meanwhile, the rest of the loft looks on (Coach, Cece, and Schmidt’s hearts seem to be breaking as they watch Nick and Jess confess how much they’re in pain and it’s really beautiful that we get to see the genuine reactions of the group) and Winston… is confused. No one told him that Nick and Jess broke up, so the pair decide to officially announce it to the group. And Winston, beautifully, expresses how much it means to him that they put aside their pain in order to celebrate his big news. Instead of continuing the celebration, the man notes that he is there for whatever either of them need. It’s beautiful and wonderful and a genuine switch from “Table 34,” where Winston basically said he would choose Jess’ side over Nick’s if it ever came down to it. Sometimes we forget that these people are crazy and weird but that they genuinely and truly and completely love each other and would do anything – no matter how stupid – to help each other out. And in that moment, everyone stands together in the middle of the loft in a circle, supporting Nick and Jess equally in their time of need. And then they hold hands. And then they hum. It’s hilarious and so beautiful because no matter what crazy shenanigans this group gets itself into, no matter how many fights or break-ups, and no matter how much history exists whether romantic or platonic, they will be there. And everything will be okay. Speaking of “everything will be okay,” the episode ends with Jess on the couch, a pile of tissues littering the floor, blasting Dirty Dancing. When her phone rings, it’s Nick – again – and she answers it. He’s just in the other room, drinking and calling her while still being able to hear everything that is happening on the living room television set. Notice anything familiar about Nick and Jess in this moment? They’ve returned to their break-up habits: Nick is drinking and calling Jess frequently and Jess is crying and watching Dirty Dancing on repeat. So what’s different about Nick and Jess in “Big News” and Nick and Jess in the pilot episode? The simple answer is this: everything. Their relationship with one another has altered them and altered their perspectives. What’s so utterly telling is how Nick responds now to Jess’ break-up habit and how Jess responds to Nick’s. Nick, in the pilot, was wary of Jess and her affinity for Dirty Dancing and he didn’t understand her heartbreak at all. But in “Big News,” Nick not only understands why Jess is watching Dirty Dancing but chimes in and tries to make her smile. Similarly, Jess doesn’t berate Nick for calling his ex-girlfriend (see: her) like she did when he used to do it with Caroline. Instead, she picks up her phone with a smile, even though Nick keeps calling her. She understands him now and understands his break-up habit because – quite frankly – she understands the PAIN behind the habit. And Nick understands Jess’ pain, too. … And then I burst into tears. Because even though I know that this break-up is necessary and right, there was something so tender and loving about the way that Nick approached Jess’ grief at the episode’s end. And there was something so raw about the way that each of them approached the other that made me actually realize something that is cliché and stupid but that ultimately everyone realizes once the tissues have piled up and the wine has emptied and you’ve listened to Taylor Swift on repeat for hours: once you realize that you’re not okay… it’ll be okay. Special SUPER EXCITING note: I got my Twitter question asked on Larry King this week! Liz, Brett, and Dave gave a great response and thank you Emily for showing the clip to me! I’m so glad we got to see Joan Day and Tran again! Schmidt outside of Cece’s bedroom door made me laugh so hard. I didn’t think that the “Winston has a cute yawn” gag could be better than it was initially but then IT GOT BETTER. Actually, Coach was the MVP of this episode because his greeting for everyone was amazing. We just returned from a mini-hiatus only to go back on hiatus again. The next new episode featuring a school dance (and appropriately titled “Dance”) will air on April 19th. Until then, folks, have a great weekend and happy Easter!